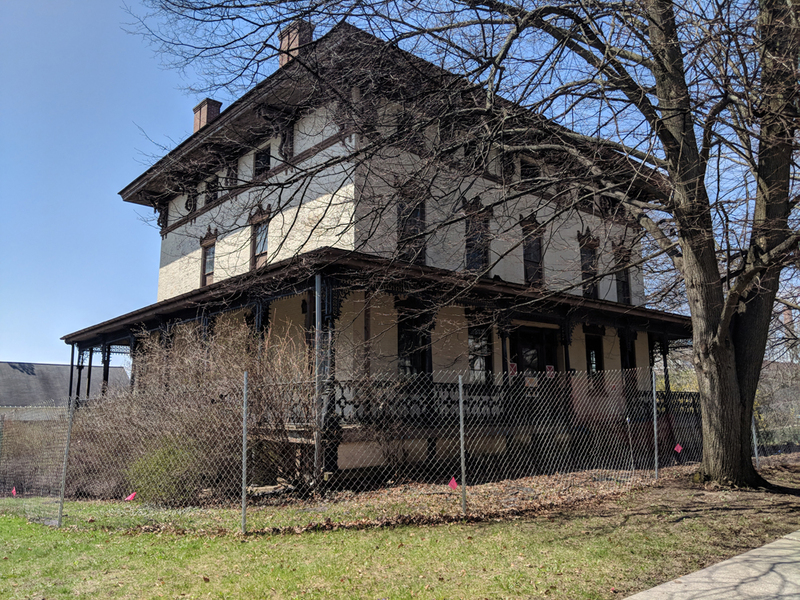 Built in the 1850s as the home of Nehemiah and Louisa Denton, this Italianate style mansion and farm became the first home of the New York State Agricultural Experiment Station in 1882. Eventually, the building was named for Percival John Parrott, Director of the Experiment Station from 1938 to 1942. Parrott Hall has sat vacant since ownership was transferred to the New York State Office of Parks, Recreation and Historic Preservation in 1975. In recent years, it has experienced significant deterioration. A non-profit organization, the Friends of Parrot Hall, was formed in 2017 to intervene and advocate for reuse. During the summer of 2018, a coalition formed, including The Landmark Society, the Preservation League of New York State, Friends of Parrott Hall, and the City of Geneva, to save the building from imminent demolition. The Coalition is now working alongside the New York State Office of Parks, Recreation and Historic Preservation to raise funds for stabilization and ultimately to formulate a plan for and raise funds for reuse. Parrott Hall was the first property in Geneva to be listed in the National Register of Historic Places. It offers a rich historic, scientific, agricultural, and architectural legacy to the Finger Lakes and New York State. Although the building faces significant repair needs, with an economically viable plan for redevelopment and significant fundraising efforts, Parrott Hall could once again serve as an asset to the Geneva community. Built in 1890, the former Odd Fellows Hall in the village of Holley sits at a prominent corner in the village square and is listed in the National Register of Historic Places as part of the Holley Village Historic District. Vacant for the past two years, this two and a half story brick building is at-risk due to neglect and masonry deterioration. Larger and more imposing than its immediate neighbors, this anchor building is a key element in Holley’s downtown commercial district. 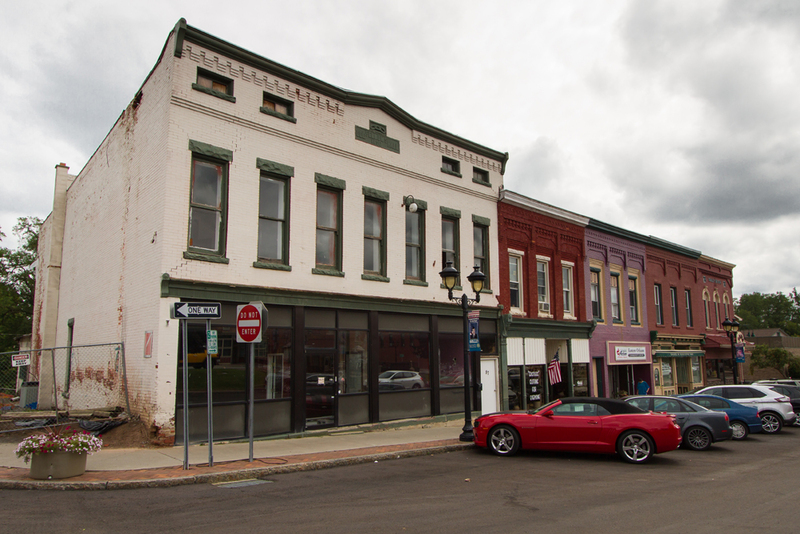 A new owner and a plan for reuse are critical to the ongoing revitalization of downtown Holley. Now vacant, this former industrial building located along Routes 5/20 outside of downtown Seneca Falls, once housed the National Yeast Company and later, a luxury car manufacturer. Most recently, it was occupied by a car dealership that relocated. While proposed plans to construct a gas station and convenience store on the site call for demolition, this prominent brick building would make an excellent candidate for adaptive reuse as housing, artists’ studios, mixed use, and more. Solidly built and consisting of almost 30,000 square feet of flexible, naturally lit space over three stories, this structure should not be relegated to a landfill. 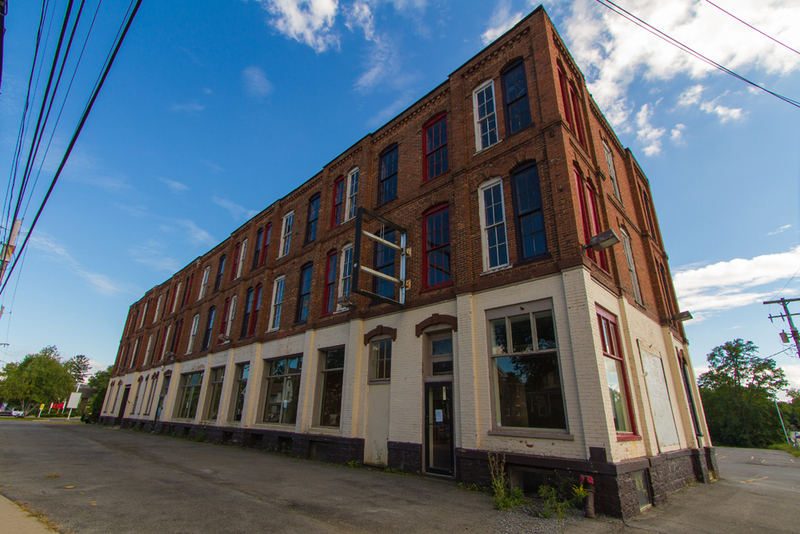 Reuse of the existing building would also help retain the character of this historic corridor in Seneca Falls. 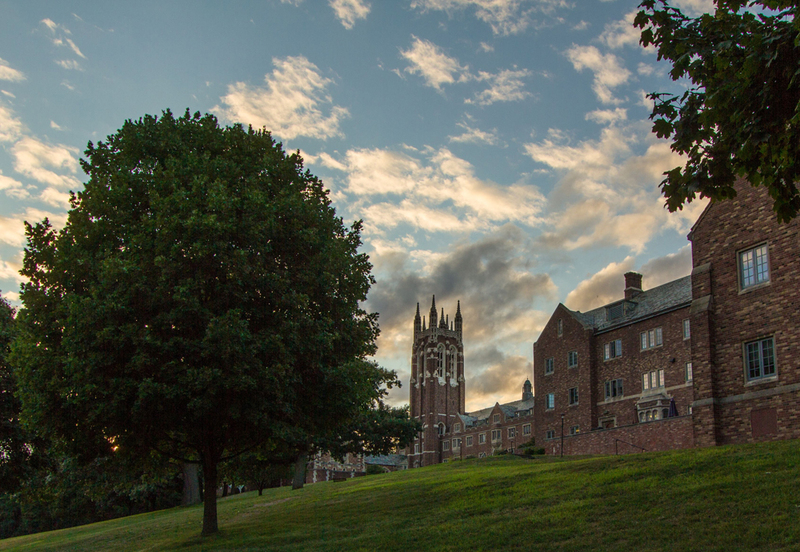 Located in the Highland Park neighborhood of Rochester, on a prominent 23-acre hilltop site, the Colgate Rochester Crozer Divinity School campus features architecturally and historically significant buildings as well as a historic designed landscape. The Collegiate Gothic style buildings, which include a chapel, dormitories, classroom building, and President’s residence, were designed by noted architect James Gamble Rogers in the 1930s. The landscape was designed by noted Rochester landscape architect, Alling DeForest. The campus is also historically significant for its association with numerous social and cultural figures and events. It has historically been a center of religious and academic inquiry that educated, fostered, and supported many leaders in the Civil Rights movement including Bernice Fisher, Mordecai Wyatt Johnston, Howard Thurman, and Malcolm X. The property is a designated City of Rochester Landmark and is eligible for listing in the National Register of Historic Places. After nearly 90 years, the Divinity School is relocating to a new site, leaving the future of the campus uncertain. Prior and current proposals for redevelopment have called for the construction of new buildings on the south lawn, a character defining element of the campus’ original design and essential to its context adjacent to Highland Park. Current proposals do not address the significance of the existing historic buildings or landscape. A unique property in the city of Rochester, with its scenic views, grounds, high style buildings, and desirable location, the CRCDS campus possesses great potential for redevelopment. These assets, however, could easily be destroyed by insensitive development and an appropriate fit of program and scale is critical to project success. Any new use of the site must be encouraged to make the best use of these resources, complemented by sensitively designed modern infill where needed. 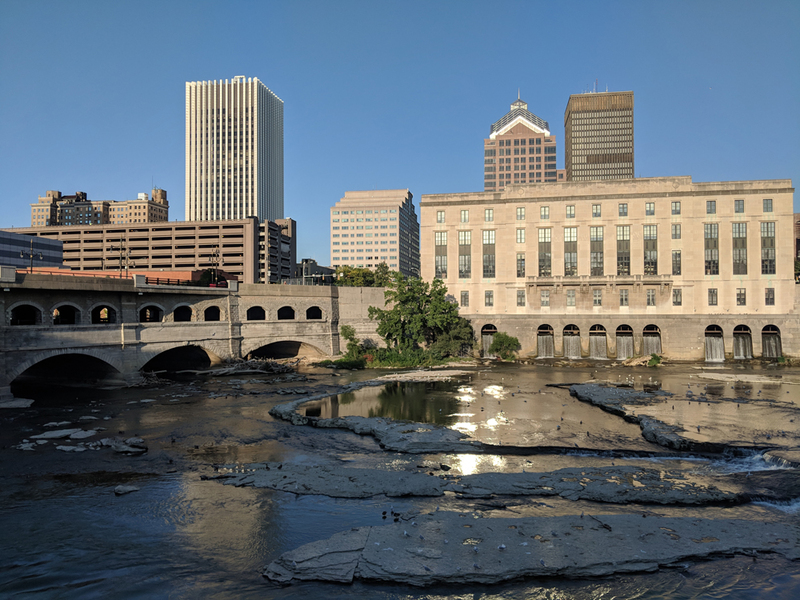 With the announcement of the ROC the Riverway’s Phase 1 recommended projects, fueled by a $50 million investment from the State of New York, this is an exciting time for downtown Rochester’s Genesee River corridor. The City of Rochester has consolidated over two dozen riverway projects under one bold vision to maximize their impact and to enhance and leverage one of our city’s most unique assets—the Genesee. The ROC the Riverway Program has the potential to transform the River corridor and bolster the ongoing revitalization of downtown Rochester. The success of this Program will require meaningful community input, strategic decision-making, and inventive concepts that still respect their historic content and context. More than most of the projects covered under the Program, the success of the Aqueduct Terrace is particularly dependent on how it is executed and the quality of the design. The re-imagined Broad Street Aqueduct is billed as the “centerpiece of downtown transformation.” The prospect of such a transformative project is alluring and we support the ideas and principles underlying the City’s proposal to create a dynamic, human-scaled, connective and accessible public space. Such an important and prominent project in such a sensitive location must, however, be executed with the utmost care. A designated City of Rochester Landmark, the Aqueduct itself is a visual icon for Rochester; it is an integral piece of the city fabric. The proposed project incorporates or connects eight separate historic resources, four of which are listed in the National Register of Historic Places. For these reasons, voices representing the interests of historic preservation must be represented in this design discussion and engaged in the planning process. The goal of such an exchange is not to impede a new vision, but to help ensure the catalytic integration of the past in this new, dynamic transformation.